We've all heard it...but what does it really mean and does it really help? Hopefully, I will mike this concept real, effortless on your part (in time), and simple enough that you feel as though that you CAN do you part, no matter how small you may feel it may be. EVERY LITTLE CONTRIBUTION HELPS! 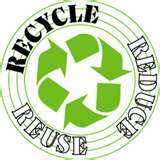 I always ask myself..."Can I reduce my carbon footprint, reuse it, or recycle it?" If the answer is no, I do without it. If your efforts have exceeded the beginning steps you may get a little more out of the "Reducing Your Carbon Footprint" page. The concept of reducing really will become a "no-brainer" in a very short amount of time. Basically, this concept encompasses everything from reducing the amount of trips (regardless of how short) you take in your car, to how much water and energy you consume, to being aware of the manufacturing practices of the products you buy. Start with these simple ways to reduce and before long you will be installing solar panels and wind turbines and riding your bike to the local farmers market ;-) !!!!! Reduce and be aware of how many times you jump in the car to run an errend only to come home and go back out because you forgot something. Reduce your water consumption by taking shorter showers and collecting rain water to water your garden (more on this in the gardening section). Reduce your electricity consumption by reducing the thermostat, turning off lights when not in use, replace conventional bulbs with energy efficent compact fluorescents, and unpluging phantom electronics such as cell phone chargers. Reduce the amount of disposible products you use and make sure that the manufacturs of the products you do buy are making efforts to do their part by manufacturing items that are recycleable and/or manufacturing using post consumer recycled products. Products that are packaged in plastic may be "easier", but glass is a cleaner and safer product to make, to reuse, and to recycle. Plastics are in and of themselves a dangerous material for you and the planet to produce,reuse,and to recycle. But if you do find yourself purchasing products packaged in plastic...please recycle them. Reusing products is another simple concept and not a new one at that, just ask your grandparents! My mother is famous in our family for this one. I am always amazed at what she can do with something that had a totally different original purpose. Again, start off small and you too may be like my mom and find clever and earth saving ways to reuse just about everything! Ask yourself, "Do I really need ANOTHER plastic bag?" Again, they are recycable, but the production of making them and the process by which they are recycled is counterproductive. Get yourself a reuseable bag! They make and sell ones of every size and color now, just be sure the fabric is of an organic and fair trade material. Or, if you sew like I do, make your own. Aren't they GROOVY! STOP buying plastic water bottles, please! This actually falls under reducing and reusing. Invest in an aluminum reuseable water bottle instead. You reduce by not contributing to the manufacturing, fuel shipping, and plastic recycling efforts, and of course you can use the aluminum bottle over and over again. I found a really cool vintage one at a thrift store and it ROCKS! And again, plastic bottles are recycleable BUT...well, you know the drill by now. The truth is, you can recycle almost every item you would normally throw away! Just rinse it, seperate it, and take it to the recycling center. I live almost an hour away from the nearest recycling center, so no excuses! So get to it and recycle! And don't forget that your organic (plant based no animal products) kitchen scraps are recycleable too...it's called compost! Read more about starting your own under the compost tab.